More and more I’ve been noticing that people these days have a great thirst for spirituality, and especially for prayer. It seems that the more our contemporary culture throws at us an anti-faith and materialistic mindset, the more something deep within calls to us. I think this is what has moved people to search for some sort of spirituality. “New Age” movements have sprung up like dandelions; for instance, there has been a renewed interest in Buddhist meditation. There has been a modest increase in interest in Christian spirituality too, though admittedly not as great as such things as those “New Age” movements. Christianity has been tried, and is has been found to be very, very difficult, mostly because of its sexual morality, which uncomfortably challenges many in today’s “liberated” and sexualized society. When it comes to prayer and its many forms, however, Christianity can offer a wealth of resources. That so many Christians today don’t know how to pray, or simply don’t pray, speaks volumes about the terrible job we have been doing in promoting and teaching prayer. In this entry, I would like to spend some time on what many in the Church call contemplative prayer. I will attempt to provide some sort of practical guide that can be followed by people in all walks of life. Perhaps the best image to describe contemplative prayer is the image of a couple that has been married for many, many years. Imagine a couple sitting on a porch in the evening, looking at the sunset. The two of them have spent many years together – much has been said in their marriage and much has been experienced: the good, the bad, and the ugly. Yet now, words are not necessary. They are quite content with sitting in each other’s company and enjoying each other’s presence. It is a loving, gentle presence that is tranquil, yet at the same time, very much felt. It is the same with contemplative prayer. 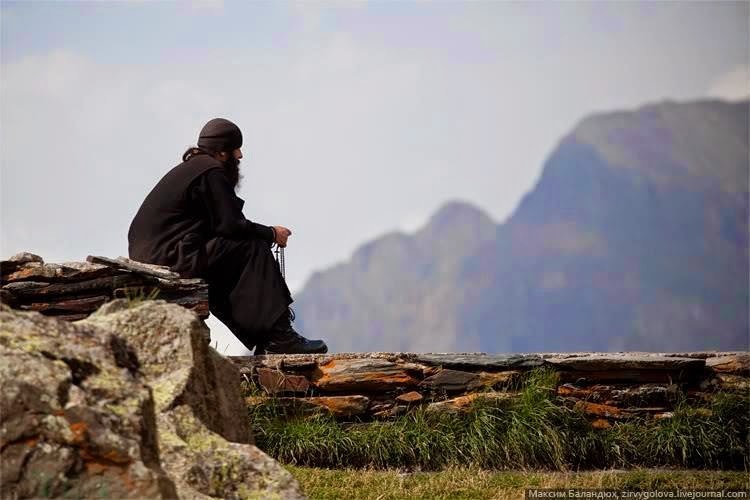 Contemplative prayer, in some aspects, is similar to what Aristotle called “contemplation”, the summit of ethical life. For Aristotle, when the four cardinal virtues – courage, temperance, justice, and prudence – are lived out faithfully for many years, it disposes the person to the contemplation of divine truths. Some consider this a kind ofstudying, but this is an incorrect understanding of what this last stage is all about. We are not to study these eternal, everlasting truths, but rather relish them and dwell upon them. Perhaps a helpful example would be mathematics and geometric proofs. Think of the labour of getting the final proof as the cardinal virtues, and the end product, the final proof, as Aristotle’s contemplation. The Pythagoreans exemplified this, as they marvelled at and contemplated the elegance, beauty, and eternal truth of the proof after it has been worked out. Christian contemplation is similar, but with one very big difference. For Aristotle and the Pythagoreans, they themselves were the active agents in the contemplation. They took the initiative and there was no direct and explicit interaction with the Divine. For Christians, however, it is more of a receptive process. We receive interior movements from the Holy Spirit. It is God that takes initiative as we wait. The personal dimension is very much central here: God desires to deepen his relationship with us. That being said, this is not necessarily in the form of an inner conversation with God; there are other prayer types for this. Contemplation is dwelling upon the Lord’s goodness, his presence with us, and his love for us. It is, like the old couple, beholding God beholding us with great love, and simply remaining in this moment. Things will certainly come up, perhaps inspirations, or other spiritual movements, but all we are concerned with and pleased with, is simply to be with God and exchange with each other the love we have for each other. As Aristotle spoke of preparing for this moment, so also we often prepare ourselves for contemplative prayer by dwelling on a passage of scripture. It may be helpful to take a paragraph or two from the Gospels, read it, and dwell upon what moves you in the text. Then, simply be present to the Lord. One helpful attitude to keep in mind as you pray this prayer is: do not try to force anything or do not expect results. In the current society, we’re obsessed with seeing results quickly! Such concepts are foreign to the spiritual life. We shouldn’t go into prayer expecting anything. To go even further, prayer isn’t for something. We don’t pray to get something out of it for ourselves, much like we don’t have friendships to get something out of them, or at least we shouldn’t. We don’t pray to get inner peace, we don’t pray to become better people, we don’t even pray to know ourselves better. All of these things may come as a result of prayer, but prayer is an encounter between two friends, nothing more. We pray to fall deeper in love with the Beloved and to sing him praises, because we love him. If this attitude is appropriated, it will be a tremendous help in overcoming that result-oriented obstacle that so many of us have. I will end with some practical suggestions. Since many of us are busy, working people, we don’t always have a full hour to devote to prayer. It may be helpful to start slowly, perhaps with twenty to twenty-five minutes. As your prayer muscles get toned, it will be easier to add more time, or simply repeat for twenty to twenty-five minutes again later in the evening.